Information about reserving the Balloon Fiesta Park North Launch Field for your next event. For more information about rentals, please contact our office at (505) 768-6050. 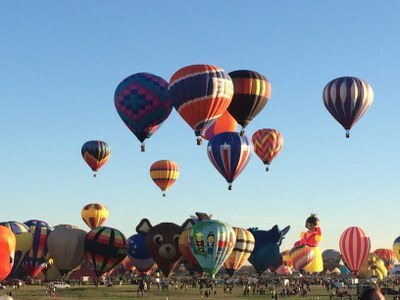 For gatherings and events large and small, Balloon Fiesta Park is a great venue! Much of the park has excellent access to utilities and parking is plentiful. The North Launch Field, the Sid Cutter Pilots' Pavilion and the Golf and Event Center are closed September and October of each year for the annual Albuquerque International Balloon Fiesta. November - August all facilities are available for rent. All facilities tend to book quickly and about a year in advance. There are a variety of requirements that come with renting the North Launch Field. Since the field is basically a blank canvas, special considerations need to be taken into account such as tenting, fencing and tables/ chairs. The staff in the events office will be happy to help guide you through the process to ensure your event is a success. The events office will review your application and invoice you for the non-refundable application fee (applied towards the overall rental total). This fee is due to officially confirm your date. Final payment will be due no later than 14 days prior to your event. At this point the events office will schedule a pre-event meeting to discuss the final logistics of your event. Rental applications must be received at least 45 days prior to your event. Larger events may require additional review and approval by the special events permitting office. Staff can help guide you through this process. All permitting requests must be started no later than 30 days prior to your event. To start this process, you will need a counter-signed copy of the Balloon Fiesta Park rental application and to fill out the permit request here. You may also be required to obtain insurance for your event. Typically, use of adjacent parking and the vendor’s concourse are considered part of the Park Usage Fee. Use of eight grass fields (excluding concession building). Maximum $2,000 per day. Minimum $4,000 per day. Entire area (all 16-24 game fields). Use of more than six fields will require an additional $100 per game field. Small events (picnics, weddings, etc.) or if only one game field or equivalent-size area is used, a fee of $250 will be charged. Use of more than six fields will require an additional $150 per game field. Small events (picnics, weddings, etc.) or if only one game field or equivalent-size area is used, a fee of $300 will be charged. Area E – Vendor Concourse Only Minimum $250 plus application fee. Minimum $250 plus application fee. For events that are held in parking lots only. For long-term leases (more than two weeks), a minimum of $75 per day is charged. Maximum $150 per day. Minimum $150 per day. For long-term leases (more than two weeks), a minimum of $100 per day will be charged. Maximum $300 per day. Minimum $1,000 per day. Use of this area is only allowed as part of scheduled event. Excludes Balloon Museum, Golf Center area, Los Angeles landfill and areas under construction. Maximum $10,000 per day or as negotiated. Minimum $30,000 per day or as negotiated. The stage on east side of field can be used at no cost though it can not be used for concerts. $250 fee to setup the stage for an event. $250 fee to setup the stage for an event.